Not long ago, New York and its neighboring states suffered never seen before tragedies because of Hurricane Sandy. We are still scratching our heads wondering how could we ever have had such a hurricane in this part of the world and now... more than ever... we are in need of some cheering up in a big big spectacular way. My kids and I never watch the parade on TV or in real life but this time, we will. As I hurriedly prepare to run off to my son's Thanksgiving event at school, I can not help but tell you about this extraordinary book that I KNOW the readers here WILL LOVE. They are reading it at my son's school right now as I write this on this special last-day-before-T-day break-day. I was planning on writing something else for today.. something about shopping... I was only going to write something short.. maybe on Facebook about Balloons over Broadway but as I write these words, I know that's not going to happen. This is a maker. This is how they think. This is how they plan. How wonderful to see it all in pictures. I'm sure many makers think in pictures too. Number 1 Son does. So here it is, my Thanksgiving Day post in the form of .... why of course... a thank-you letter! Thank you sooooooooo much for writing and illustrating this book. When I read it, I literally felt like you had written it just for my children. My children are kind of the off-center type and while I love that, at times, I forget to celebrate that. It's terrible but it's the truth. Your book reminds me that the creative way my child sees things, while it can be a total pain in the arse for me, can also be something wonderful. I love how you talk about the childhood of Tony Sarg, the inspiration behind the famous Macy's Thanksgiving Day Parade. My child is all about making things even if it is to save himself some work. Sometimes I forget that this is a good thing and that he is not as lazy as I am thinking he is. 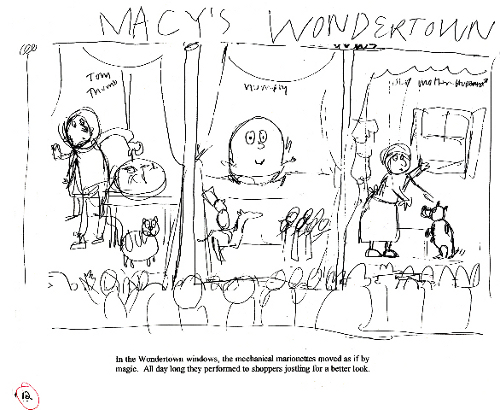 I love how you present the real-life challenges that this puppeteer-turned parade creator faced in meeting the needs of the Macy's employees. I love how you demonstrate the evolution of an idea that was meant to solve a smaller problem but then ended up being much bigger than anyone imagined. It really does tell children indirectly that anything is possible. AND.... How cool that Tony Sarg created the parade first for the immigrant workers at Macy's! I am a child of immigrants too! I want my children to understand the immigrant experience even though they were born here. Moreover, as this is such a tough time in New York City right now, it felt great reading about this book again in the New York Times article written by the legendary Pete Hamill. I love how you detail the challenges and depict Tony's concerns before the big day. It really demonstrates a truth that inventors need not know it all and that all we can do is TRY. I even love how you show the eureka moment for Tony and how you depicted it in shadow. That is wonderful. Every eureka moment is so private for everyone. It was great that you left it so undefined and undetailed. It gives kids the chance to fill in the blanks with their own moments of brilliance. This is a book that we will have in our family forever. It's also the kind of book that I would gift to almost all of my children's maker-type buddies who love reading non-fiction stories. We usually don't get to see non-fiction stories in picture books. Most of the time, they are rather encyclopedic and the photos become dated really fast. However, your book not only meets their non-fiction tastes but also appeals to their needs as a child. It is cheerful, colorful, and encouraging. Thank you also for your support and for being the first inventor to be profiled here. The readers here loved it. It felt good to tell your story. I truly believe our kids' can grow their emotional intelligence by relating more to the people who make their toys. I hope we can read another story about someone like Tony Sarg. Your book is a gift to us all. Thank you and have a wonderful Thanksgiving holiday. Happy Thanksgiving to you all! Thank you for coming to read these reviews! P.S. Thank you for the Activity Kit for Balloons Over Broadway! We are definitely going to make puppets tomorrow morning as we watch the parade on T.V. We just may do them tonight! Now you can win your own Balloons Over Broadway! Disclosure: Toys are Tools has not been compensated in any way by the manufacturer of this product. The product was given to Jenn and her kids because Melissa Sweet as a gift- it was even autographed with a little note to Numbers 1 and 2! Reviews are never promised to anyone in exchange for anything anyway. The giveaway prizes are being donated by Santa Claus. This book is amazing. I love that it shows my daughter that the projects and art she creates today could end up turning up bigger than she ever imagines. I love Melissa Sweet's illustrative style. We have some of the eeBoo products with her designs. The book looks right up our alley, as I really enjoy children's books that are based in reality! 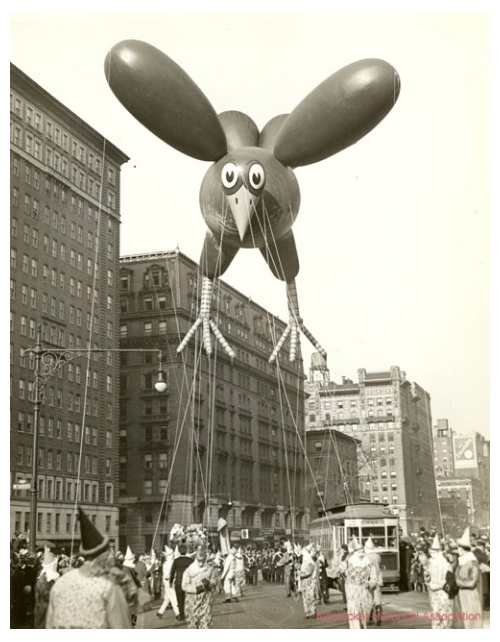 I have such fond memories of the Detroit Thanksgiving Parades (the 2nd oldest next to Macy's), and I always loved the floats. I wonder what will happen to the balloons with the helium shortage? Do these great big ones even use helium? I used this book to teach our youngest students about biographies and how to retell a story. They loved Ms. Sweet's illustrations and wonderful story about Tony Sarg. As they left for Thanksgiving Break they couldn't wait to see the Thanksgiving Day Parade and tell their families how the parade began. I think there were more than a few of them thinking about what they might invent to get out of doing chores at home. Reminds me of my Mom telling us stories of when she was little and would watch the parade . We had fun today watching it on tv. Love it! I think this book is interesting because it's not something one necessarily thinks about. I work with preschoolers who love trying new things, but often get frustrated and quit if it doesn't work. This looks like a great autobiography of someone who created something fun and functional. It looks like it would be fun to read with the kids.